Its been a busy week for the MapleScape staff team but boy oh boy has it been worth it. You won't want to miss out on the new content & changes within this update or the upcoming updates. Read below for more information! Our new homepage is now live! It looks much more sleek and professional than our previous one. We can also provide players with much more information on the homepage its self rather than making them log in or visit the forums without even seeing a single detail! Along with this great change, Our website is now much more secure. We have implemented Cloudflare Railgun services that not only helps secures peoples connections to the website and give us an extra layer of DDOS protection; It will allow our website to load quicker for players who are outside of the U.S. We have also received and implemented an SSL certificate to further secure the data of anyone visiting the website. We don't want anyone to feel unsafe when visiting our website and these are just 2 steps we have taken to ensure the safety of the community. The experience cap has been raised from 200m to 2.1b! With this raise we have also implemented a system that yells when players reach; 100m, 200m, 500m, 1b, and 2b experience in any skill. I am contemplating rewards for reaching 1 and 2 billion experience but want to make sure I poll balanced items that are worth the grind. If anyone reaches 1 or 2 billion experience before a reward is implemented they will personally be compensated by me simply by asking. The players who I know or will personally see hit these milestones will be noted and will not need to contact me to receive the reward. The newest addition in our quickly expanding list of quest has been released! 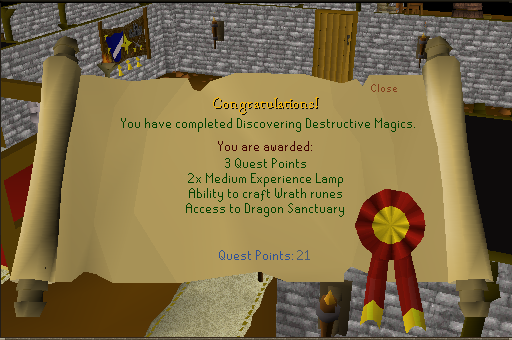 You can start this quest by teleporting to lumbridge and visiting the Lumbridge Castle kitchen and speaking to Duke Horacio. With this being our second quest released I have decided to only make it a quest with "medium" length & difficulty. However, this is meant as end game content so you will need 84 Herblore and 95 Runecrafting before the Duke will speak to you. This quest has been a great experience for me to expand on my skills related to writing these quests. The dialogue may be short but it definitely ties things together well and makes it very clear what is needed for the quest. The actual code for the quest is much more clean and functions much better than the previous version of Helping the Elders. So much better in fact, I rewrote Helping the Elders & it can now be completed again by players who completed the old one. The only extra benefit this will provide to you is a Small Experience Lamp so I see no harm especially when the trade off is QUALITY. You can now receive a Wrath Rift Guardian while crafting Wrath runes. Added special attacks for; Arclight, Statius' Warhammer, Vesta longsword.